Admissions tests are for admissions purposes. Find out what you need to know about test policies, deadlines, and how colleges will interpret your scores. It’s Here! Our college admissions requirements data is one of our most popular resources. Our 2019 edition will make planning your standardized test schedule & putting your best foot forward with your dream school much easier. 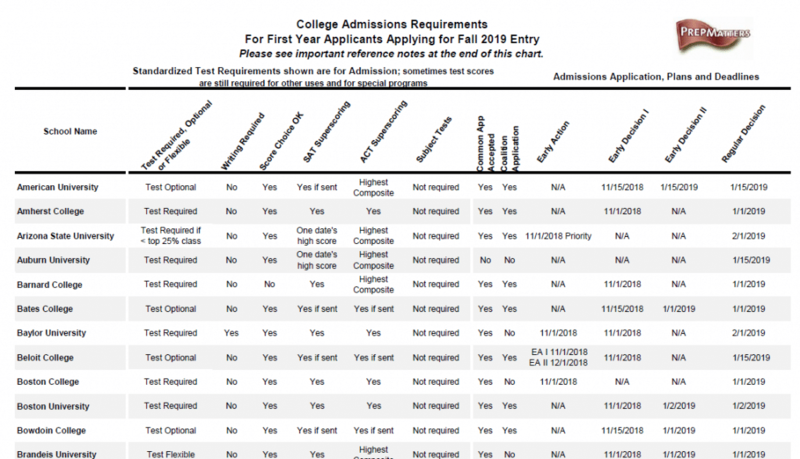 We’ve compiled the absolute latest admissions requirements for 150 of the top schools in the country into one .pdf for your convenience. Learn which schools superscore the SAT and/or the ACT, which now request that you send all scores, and which have deadlines when…all here in one place. We are pleased to provide this beginning information to help in your research. Please note that it is provided as a courtesy and is neither an official nor complete representation of any college’s policy. It is subject to change at any time, so users are advised to verify specifics before making admissions decisions.